For more information about this Proven Safety Countermeasure, visit the Office of Safety's Intersection Roundabouts and Mini Roundabouts web page. The modern roundabout is a type of circular intersection configuration that safely and efficiently moves traffic through an intersection. Roundabouts feature channelized approaches and a center island that results in lower speeds and fewer conflict points. At roundabouts, entering traffic yields to vehicles already circulating, leading to improved operational performance. Roundabouts provide substantial safety and operational benefits compared to other intersection types, most notably a reduction in severe crashes. Roundabouts can be implemented in both urban and rural areas under a wide range of traffic conditions. They can replace signals, two-way stop controls, and all-way stop controls. 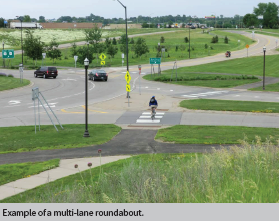 Roundabouts are an effective option for managing speed and transitioning traffic from high-speed to low-speed environments, such as freeway interchange ramp terminals, and rural intersections along high-speed roads. 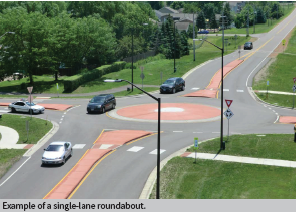 FHWA encourages agencies to consider roundabouts during new construction and reconstruction projects as well as for existing intersections that have been identified as needing safety or operational improvements.